According to tradition, a Fleming named Freskin was given land by King David I in the area known as "Moray" (in Gaelic 'Moireabh' which means 'sea-settlement') in the 12th century and his descendants took the name of the area. Over time it became Murray, the most common "territorial" name in Scotland. One branch became the Earl of Sutherland and another branch, by marriage, Lords of Bothwell in Lanarkshire. Sir Andrew de Moray was an ally of William Wallace and participated in the Battle of Stirling Bridge in 1297. By further advantageous marriages ( a standard event in those days) the Murray family inherited lands in Abercairney and Tullibardine in eastern Perthshire and in time the Murrays became the Dukes of Atholl with estates covering 300,000 acres. A descendant became the Earl of Mansfield who built the magnificent Palace at Scone. 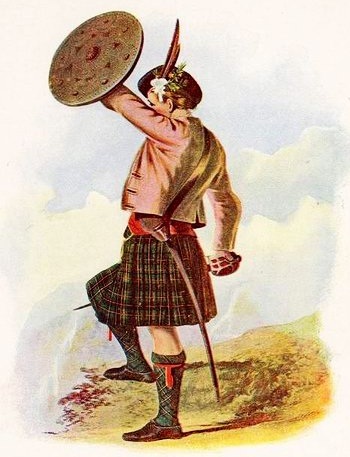 The 6th Duke of Atholl founded the Atholl Highlanders who so delighted Queen Victoria that she granted the Duke the right to bear arms, a unique privilege for an individual in the UK. The clan motto "Furth Forth and Fill the Fetters" dates from 1475 when the Earl of Atholl was sent by King James II to suppress the Lord of the Isles. Murray was the 12th most frequent surname at the General Register Office in 1995. CREST: A mermaid holding in her dexter hand a mirror, and in sinister a comb all proper. ORIGIN OF NAME: Place name: Morayshire.